Citroen's new specs feature four rings, which contain moving blue liquid that can replicate the horizon line. This allows the wearer's sight to 'resynchronise' with their sense of balance. After wearing them for 10 to 12 minutes, your motion sickness should disappear and you can take them off, according to Citroen. The product is the world’s first pair of glasses that stop motion sickness (also known as Kinetosis) in adults and children over the age of ten, as this is when the inner ear has finished growing. There are no lenses in the glasses so they can be shared between people that sufffer from travel sickness. This also allows them to be worn over prescription glasses. 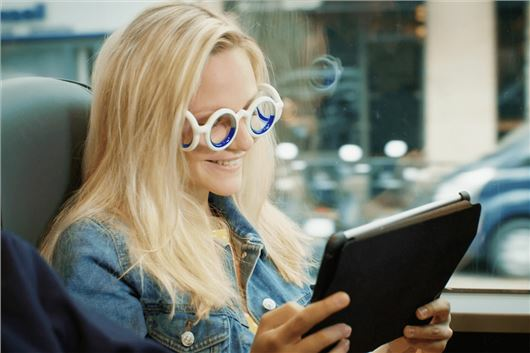 The SEETROËN glasses were developed by Boarding Ring, a start-up company based the south of France who's technology has an effectiveness rating of 95 per cent. Despite the interesting design, they could be the perfect gift for the motion sickness suffered in your life. SEETROËN glasses are available from the Citroën Lifestyle Boutique at a price of €99. Take a look at the video below to learn more.